A friend of mine and I were talking about comic distribution and some interesting points came up, including how McCloud's definition of "comics" might actually hurt the growth of the medium. I'll get back to that one. My friend noted that "comics" are coming to be split into two major groupings of mainstream works and graphic novels (largely dominated by memoir), and that "comics" were once again coming to refer to the latter as a more niche label of superhero/fantasy/sci-fi/-ish genres. Part of our discussion focused on the inadequacy of the distribution to "comic stores" for appealing to customers who might not have any interest in that niche. I've argued at length before about how if someone were to write a compelling baseball "comic" that would appeal to baseball fans (which outnumber "comic" fans by a lot I imagine, when they aren't overlapping), only selling it in a "comic" store would not reach the real audience intended to buy it — you'd need to sell it in sporting-good stores, batting cages, baseball games/stadiums, etc. (in addition to non-niche places like grocery stores). Now, when McCloud tried to define "comics" back in 1993 as "sequential images," I think (?) his intent was to move the label beyond its stereotyped niche. Using such a formalist/structural definition would seemingly let so many other things into the fold that superheroes/etc. would become just another genre. But instead of "comics" becoming the superordinate category to the benefit of the medium, I think this has actually had a negative impact for those that have adhered to it. Instead, it seems as though it only cast a wider net for all those things that break the stereotype to be sucked into the associations of "comics." My hypothetical "baseball comic" would only get hurt by being called a "comic" and being carried in "comic" outlets because readers of said genre already have predispositions toward things called "comics." Indeed, the only real growth areas in the industry right now are things that have both evaded those stereotypes and use new labels altogether: "manga" or "graphic novels." I actually think it's fine for "comics" to refer to a niche, since it gives it a reliable label. And, there's nothing wrong with that, especially if we have a notion of the sequential graphic communication system that is separate from the notion of how that graphic system appears socially. It's also fine for that niche to be found reliably in "comic stores," while other graphic works that don't need to be called "comics" can viably be sold in other marketplaces. We shouldn't limit potential graphic stories and books to the labels and distribution venues of a niche they don't belong to. Doing so would only ensure that they never sell to their potential and that the medium never reaches beyond niche works. 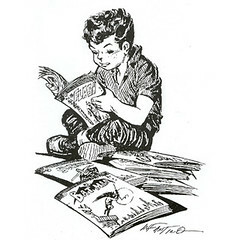 Neil: I have given a number of presentations and taught classes about comics to general audiences, and I have had no trouble with getting buy-in to the notion that "comics" is an superordinate category that includes comic books, the funnies, graphic novels, and so forth. I don't think the resistance to tweaking our collective labeling is as formidable as you think. I also push the term "graphic book" (which you favor), since I find it much more appropriate than "graphic novel" in most applications. Thanks for the comment walaka! Of course people don't have a problem with it when you give it to them as a proposed definition — that's exactly what McCloud did, and it worked extraodinarily well. The problem is that 1) it isn't "true" or useful as a definition, and 2) it does no good to helping to expand the marketplace in practical ways. Again, note the success that both "graphic novels" and "manga" have had skirting the term "comics." It's not just a new label, but a whole new mental framework, which I've talked about before. Just to let you know I agree with you. The word comic (and I should add the comic looks) is loaded with meanings regarding market target, themes and distribution channels. We developed an interactive drama, Masq, that borrows a lot from the traditional "comics" grammar and therefore many call it an interactive comic, game comic, etc. Still its potential market is much larger than comic consumers. Thanks for the comment Javiar. I believe we met after a talk of mine at the ComicCon several years ago, and you showed me Masq then, no?